The backdrop to this post is our recent news (see Newsletters) that we are expecting a 5th baby at the beginning of May. We learned this just after Christmas and suffice to say that it was quite a surprise especially given that Debbie was already around half way through! Questions about such as; Why us? Why now? Why not for others? How are we going to cope with five? We’ve been wrestling with this but feel like we are starting to get our heads around it. The chances of this happening were very slim indeed and yet nothing is impossible for God. He’s chosen to bless our family with another life. My aim here in this posting is to wrestle with the concepts of faith and hope when we do not understand God’s plan or what He is doing. There is nothing that happens which is out of His control. Jeremiah makes this clear, “Who can speak and have it happen if the Lord has not decreed it? Is it not from the mouth of the Most High that both calamities and good things come?” (Lamentations 3:37-38). The Apostle James also writes that “Every good and perfect gift is from above, coming down from the Father of the heavenly lights, who does not change like shifting shadows” (1:17). Over the past few years we’ve been wrestling with the difficulties that have been coming our way! Hence it is quite refreshing to be wrestling not so much with difficulty but with unexpected blessing. I am of course more than aware of the consequences of such blessing (we have some experience in this area!) and the fact that it will be hard work. The reality however is that every new baby is a precious gift of God and so we are thankful. “For my thoughts are not your thoughts, neither are your ways my ways,” declares the LORD. “As the heavens are higher than the earth, so are my ways higher than your ways and my thoughts than your thoughts” (Isaiah 55:8-9). The final truth is often where the ‘rubber hits the road’. Intellectually I can readily accept that God is in control and that in His wisdom He knows what is best for me but can I also trust that God is working in love even when it hurts or even when I don’t understand? This hits us at more of an emotional level and we so easy find ourselves questioning God’s love. In the space of two verses Isaiah describes the Sovereign and powerful God as the shepherd tending, caring and leading the flock which He loves. We might like to separate God’s Sovereignty from His love or even to question whether they are compatible. In reality however they are two sides of the same coin. Are you doubting God’s goodness and love? Look no further than the cross where we see God’s love vividly demonstrated. So as we look forward we do so in faith and in hope knowing that God is Sovereign, infinitely wise and perfect in love. Do I understand what God is doing? No, but I trust that God is working out His Sovereign, wise and loving plan. I can think of many logical, practical and sensible reasons why it might not be good to have another child. Yet I must trust God in faith and hope that His plan (which is bigger than me and beyond my understanding) is ultimately for the best. 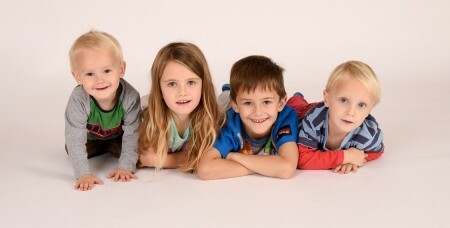 God has already blessed us with four amazing children (see picture below); why should it be any different with baby #5?